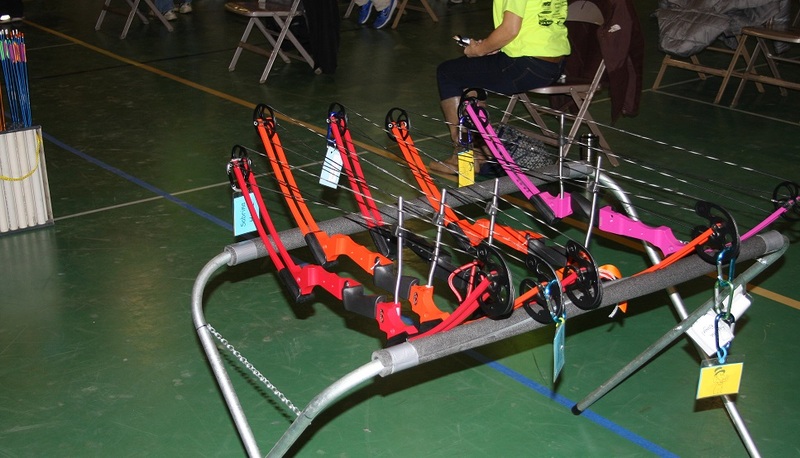 Question: Have you ever been to a major high school archery tournament? Until today, the Desk would have to answer "no" as well. A close relative of the Desk was shooting for her high school in the competition at a local field house, so the general cast and crew of the Desk went to support her and watch her compete. ... and now, a clarification, several of them in fact. A Major School Sporting Event. 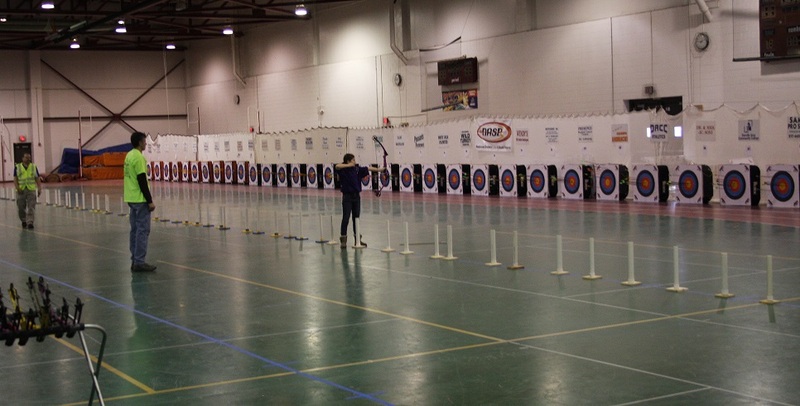 There were sixteen schools represented, with over 500 archers registered, shooting on 42 marked lanes, in six 'flights' of two shooters per target (using marked arrows), starting at 0900 and winding up at 1400. While some of the schools were 'non-traditional', others were small and rural, and a couple were major public high schools, they all stood at the same line and shot at the same target. Individual skill was up to the archer. 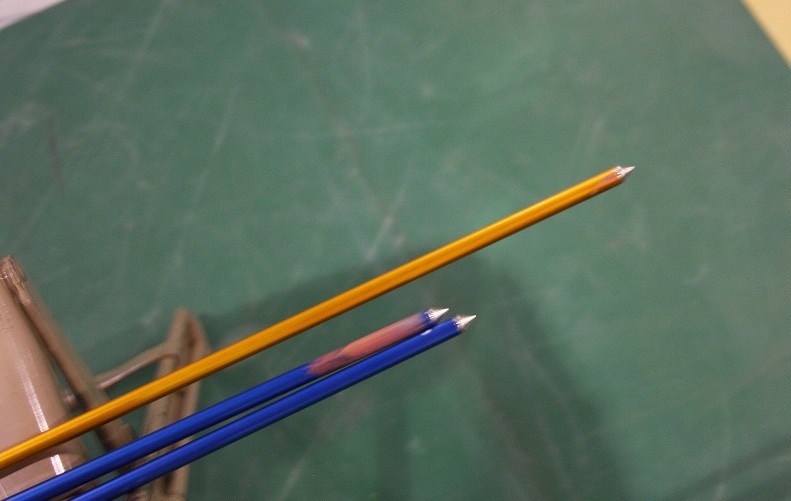 The kids were shooting Real compound bows, with real arrows (see photos below), and they were really keeping score, and would win a real trophy. Safety was a concern, and with three certified Range Masters on hand, it was not being taken for granted either. 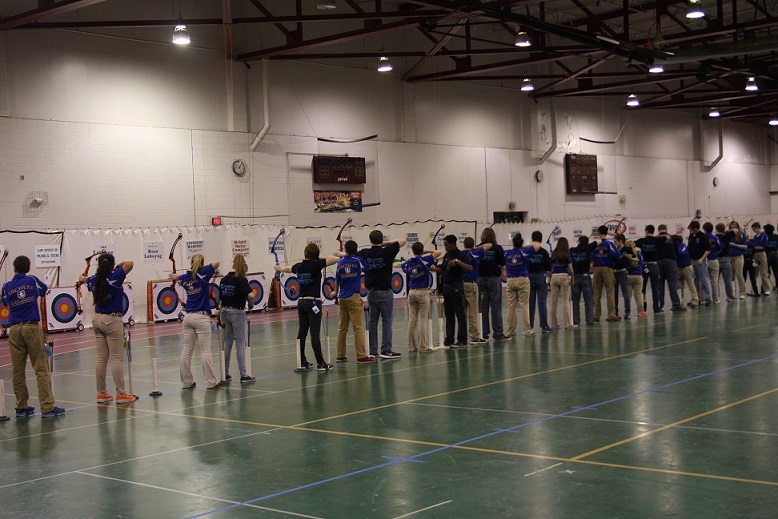 Some of the participants had been in the sport since they were old enough to both stand up and hold the bow at the same time, others had only taken it up a couple of years ago. 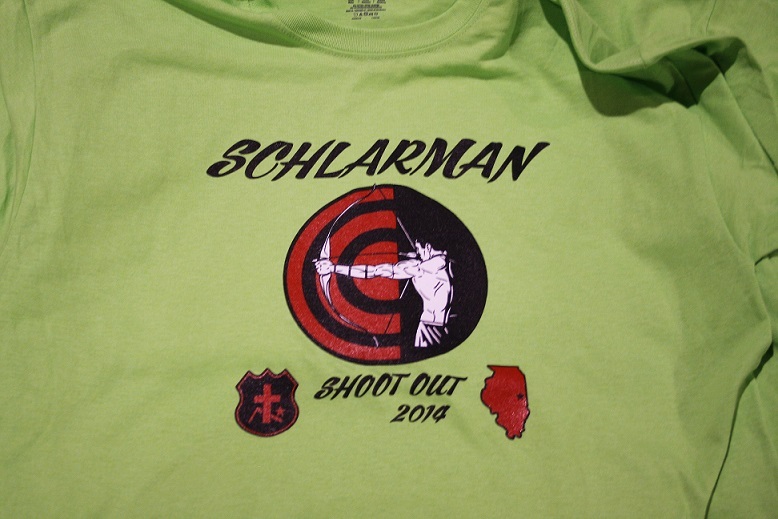 They ranged in age from middle school age shooters, one of the largest teams on hand was from Jefferson Middle School, in Champagne, IL, to high school seniors who would move on next year. And yes, you can get a college scholarship IF you are good enough, to go to, well, Texas A&M among others. The shooters are Serious about their equipment. And the organizers are ecstatic about their event's success. The original shootout has out grown the gym at the host school, Schlarman Academy, so now it has moved to the field house at Danville High School which, ironically, doesn't have an archery team, yet. And the organizers don't want to stop there. They want to take the next step and make it a regional competition and move it to the Civic Center. Most of these shooters will be at the State Tournament in March. We wish them well, as well. The archers shot from the ten meter line, then moved back to the fifteen. The sound when they all let fly at once, after a moment of dead silence while they aim, is something that cannot be described in words. No, it can't, the Desk just tried. Even with 41 others on the line shooting with you, it comes down to you, and your bow, and that circle down yonder. You, one chance to shoot, your score stands as is. Pressure? No, there wasn't a plastic suction cup or rubber ball tip in sight, if one of these hit you, we'd find out where the first aid kit was in a hurry. Some serious target shooting equipment was on display. 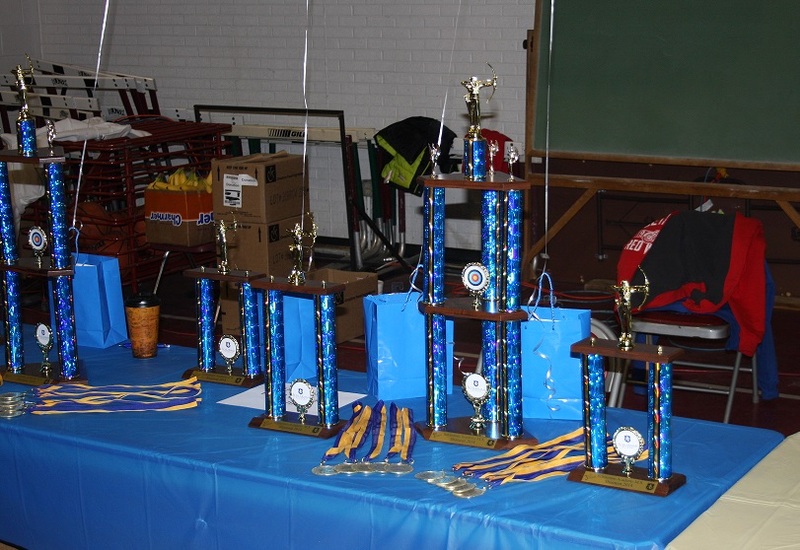 Hardware to take back to school on Monday. If you're good, that is. NOTE: The Schools identified are not responsible for any of this. The Media Desk is not affiliated or otherwise attached to any of them other than having graduated from one of them during the Carter administration. All photos taken by the Desk as described above and are property of the author. The Media Desk is a registered fully qualified domain operating as a Journalistic outlet. Opinions expressed are those of the author and not necessarily those of anything affiliated with the schools or its affiliates.